Can you Attract the Love of Someone in Specific with the Law of Attraction? | Law of Attraction Plus: The Secret revealed! 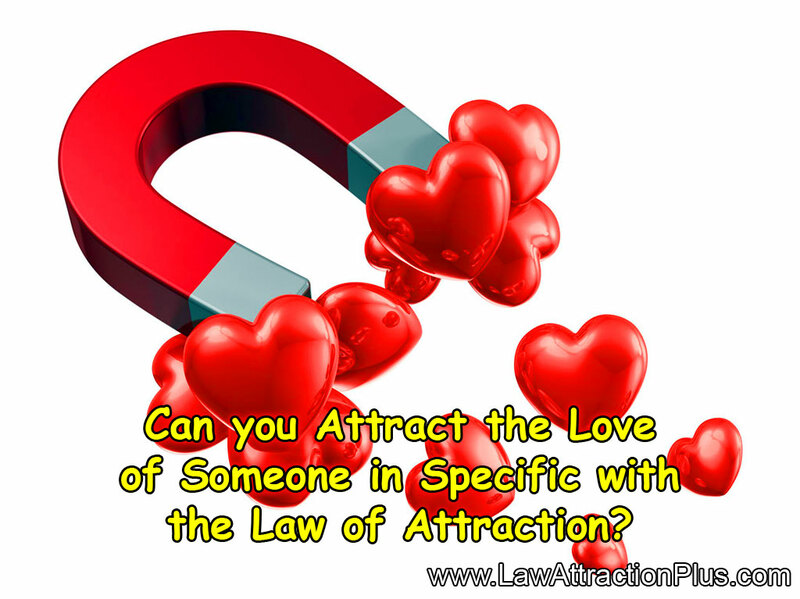 Can you Attract the Love of Someone in Specific with the Law of Attraction? "How can you attract the love of someone in particular using the Law of Attraction?" "Can you attract someone through the thought or the law of attraction?" "Can I get my partner back with the law of attraction?" These and other similar questions are maybe the type of question we get the most, whose answer cannot be 100% accurate, since it depends on multiple factors. If you think of the Law of Attraction for Love as a magical ritual, such as Moorings, Incantations or Love Spells, this article is not for you. However, if you wish the real love comes into your life, no matter who that person is but focusing on the love relationship you want to experience, opening your mind and heart to the infinite possibilities, and being willing to make a radical inner change that reflects in your attractions, here you'll find all the information you need. And if you're still reading this, it's because you're interested in attracting the ideal love into your life through the power of attraction. The law of attraction is one of the principles that rule the Universe, which is usually represented "as it is above, it is below; and as it is inside, it is outside". In other words, everything that happens inside you (both in mental and spiritual levels) finds its correspondence in the Universe that surrounds you, which corresponds to the premise I'm sure you've heard of:"Know yourself and you will know the Universe". This presentation being made, here we give you 3 steps that you can follow to Attract the Ideal Love into your life. When we say the phrase "Know yourself and you will know the Universe", it means that everything that happens inside you has an accordance in your reality: for example, if you feel necessity, you'll live in deprivation; if you feel gratitude; you will live in abundance; if you love purely; you will be loved; if you build; you will live on the top; if you destroy; you will live in the ruins. In this way, you can't make someone love you if you're not in love with yourself, therefore it is very important to recognize our virtues and all the beauty that we have, physical as emotional, mental and spiritual. This may be the biggest learning you must make, a necessary process not only to attract love but to attract everything that's positive into your life. If you don't love yourself, you believe you don't deserve. And if you believe you don't deserve, nothing positive will be given to you. Usually we see people who "love" an artist or famous person and claim to feel that love in ways absolutely immense and special, but... Why doesn't the Law of Attraction work in those cases? First of all, we should stand out that some feelings are usually easily confused, for example, desire and passion with love. It is possible that those people are "in love" with a mental image (what they think that person is) and not with the real person themselves. In fact, the artist is known in his public side but not in the intimate and private one. Anyway, this idea of "falling in love with a mental image" is something that usually happens to all of us, whether or not the other person is famous. But beyond all that, and applying it as a general rule, each one of us has been blessed in this wonderful creation with an innate right: Free Will, which represents our capacity of "choosing" about everything that is presented to us. Therefore (and thinking the opposite way), if someone wanted to attract us, but we decide they're not the right person in our life, there's simply nothing to do about it. The Law of Attraction expresses our thoughts and feelings that are aligned in the same direction. Decide to think and feel the emotional experience you wish to live and not the person you would like to give it to you. The Universe will bring you the right person so you can live something sincere and happy. To create the emotional experience is accepting that there might exist infinite possibilities. Open your mind and heart to them. Accept the possibility that better options beyond what we simply wish, might show. This doesn't exclude that the manifestation could be exactly the person you're thinking about, but also it could be someone else, keeping in mind the principle that both must vibrate in the same tuning in every level. It's not necessary to believe that only "that" person is for us. The ideal would be not to give love a name and simply let ourselves be surprised by the wonderful perfection that the true feeling of self love attracts into our lives. It is necessary to know ourselves deep down and recognize what it is we are manifesting. If it is pure love, then it will happen, but for that to happen our mind, body and soul must vibrate harmoniously with the goal that our interior is materialized outside the best way possible. Leave a space on the bed when you go to sleep. At the coffee shop, sit at a table that has two chairs. Have paired mugs for breakfast. Create the space so someone can occupy it. And deposit in that empty space the greatest vibration of love that you can feel. By reading this article, do you understand why you haven't attracted the ideal love into your life yet? Think about it and share it with our community, so we can nourish from the experience of each one of us. Leave your comment!